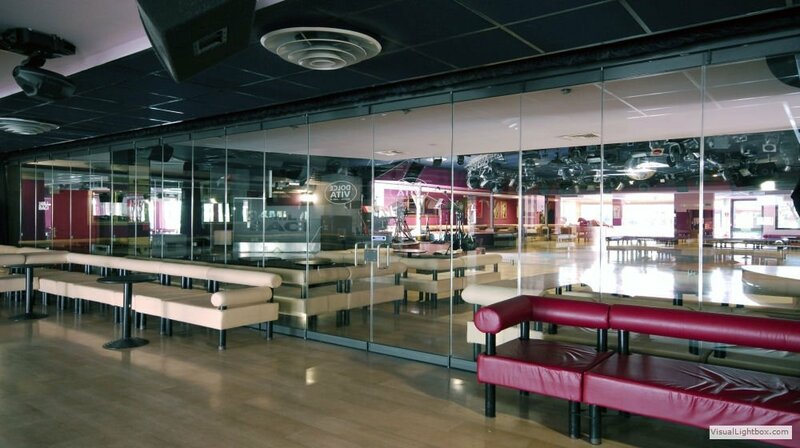 Internal partitions, all glass movable walls. The transparent or decorated GIEMME SYSTEM glass walls can transform houses, apartments, public spaces or offices into separate rooms in a few moments whilst providing privacy and sound insulation. The folding glass doors fold up immediately when necessary to create once again the open plan space. Handling of the doors (opening and closing) is extremely easy thanks to the practical and lightweight system. The GIEMME SYSTEM glass doors integrate seamlessly with the surrounding environment and are even available without the floor guide rail option. A versatile and functional divider: the doors fold and open to the side using up only the most minimum room and thus creating extremely flexible spaces. 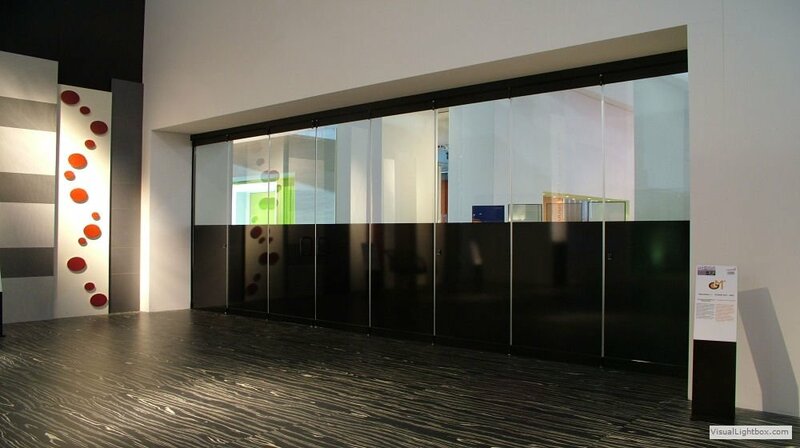 Thanks to a combination of 10 mm tempered glass and a system of transparent polycarbonate seals between the doors, the GIEMME SYSTEM glass partition ensures a high level of sound insulation. In fact the 10 mm tempered glass has a noise reduction capacity of 33/35 db. The transparent “H” shaped seals placed between the panes create a single wall sheltering from bad weather and external noise. This is great if we consider for example that a panel of 10 cm thickness has a sound absorbency of approximately 41 db or if we compare it with a 20 cm wall whose absorbency is 48 db. In hotels, restaurants, pubs or discos the GIEMME SYSTEM is suitable for partitioning a large space into smaller rooms which when necessary can be transformed quickly back into the large room. 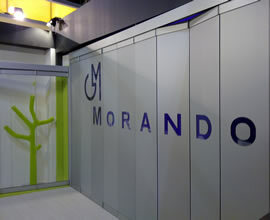 In business premises, if the partition is made of transparent plate crystal glass, it allows you to see the displayed merchandise without altering the brightness of the surrounding environment. In offices, if the partition is made from opaque glass it allows you to create an intimate setting respecting and guaranteeing both privacy and discretion. 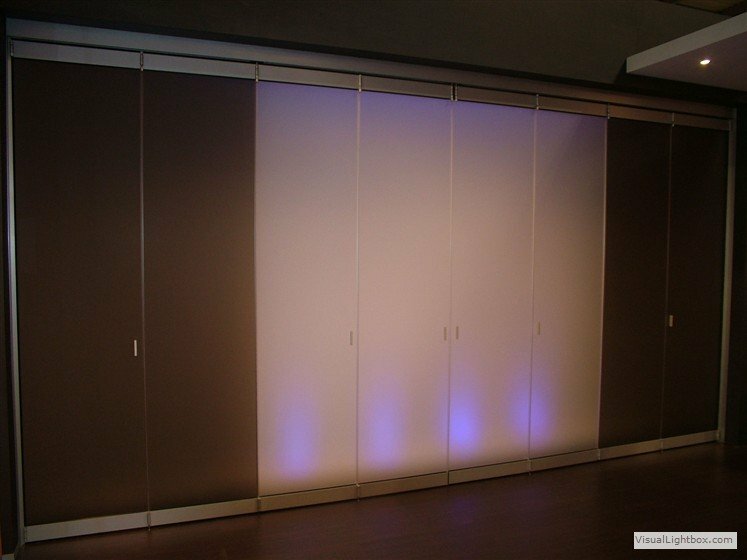 In private homes, partitions can be used as a divider between the kitchen and the living room or in bedsits/studio apartments as a divider between the living and sleeping areas. It’s a unique solution for solving otherwise unmanageable spaces. Clear glass allows you to close-off from the environment and at the same time permits you to gaze through it without altering the perception of the surrounding space; a frosted glass solution lets light in whilst dividing the room into two separate areas whilst maintaining privacy. 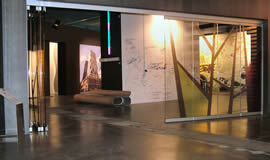 Stained glass (GIEMME SYSTEM® Décor) decorated with your favourite image gives a touch of class. Furnished with elegance and refinement and customised in infinite ways (including the choice of finishes for the aluminium parts: anodized, painted RAL standard or non-standard, wood effects etc..). We can also create real “all glass” rooms by using also the corners without mounts. In addition the special “curve-angle” system used in the corners without mounts helps to exceed angles of 90 degrees or more, making it particularly useful when you want to fold the doors up to one of the two sides, perhaps against a wall or other niche. Side stacked folding glass without an access door . It’s stacked and folded at the mounted side and even available without a floor guide rail up to a maximum of 4 doors. It is available with an external or internal opening. Stacked and folded on both sides with a centrally located access door. Even with a different door size to that of the other panels. It’s also available without floor guide rail up to a maximum of 4 doors on each side (a total of 8). 3D divider with central door and folds up to one or both sides. 3D is a classic glass partition without glass or handles. The top support rail and the floor guide rail can be lengthened to allow you to fold up the doors beyond the sight size. This solution is only available with a floor guide rail. The recessed rail and the best lighting. A good idea is to put LED lights behind frosted glass. The result will be beams of coloured lights that radiate onto the glass.